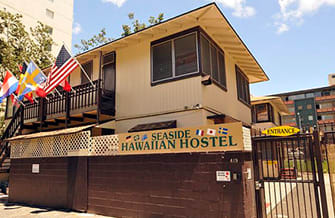 Be part of our Ohana (family) at the Seaside Hawaiian Hostel in Waikiki. 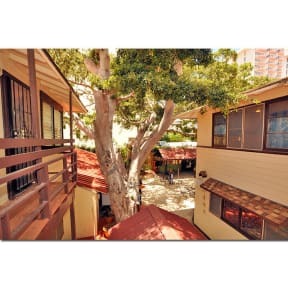 With more than 3,000 guest reviews, we are consistently among the highest rated hostels in Waikiki and on Oahu and a favorite among travelers who appreciate a place to stay that offers a small and intimate environment, well-equipped communal kitchen and spacious social areas. We're a family-run hostel that believes in keeping tradition alive and traveling affordable! Help yourself to a free (continental) breakfast of coffee, tea and toast (other items are available upon purchase) then borrow a boogie board or snorkel from our reception for free. We do cheap surfboard rental, too, because the beach is only steps away! If you need some downtime, our banyan courtyard is a tranquil refuge from the nearby street bars. There's a barbecue and full kitchen if you fancy preparing dinner here. You can sleep moments from the beach in our mixed and female-only dorms. We’ll provide you with free linen and towel at check-in. Rooms have lockers where you can store a small backpack and any other valuables you're traveling with - just be sure to bring a lock with you. My friends and I enjoyed the hostel. Travelers and employees were really nice. I will recommend this hostel without hesitation for anyone is going in Oahu. Everything went great ! Had an upgraded room for free. People are super nice ! Rooms are clean ! Would stay again for sure ! Une ambiance au top du top !!! Hyper facile de rencontrer des personnes dans cette auberge et tout est fait pour qu'on se sente bien ! Staff hyper accueillant. L'auberge est super bien placée, à 5 min à pied de la rue principale de Waikiki beach et permet de louer des planches de surf pour 14 USD la journée. Les commodités sont basiques mais propres. Un super moment passé au seaside vraiment ! Auberge très agréable, à proximité des bus, de la plage, et de tous les magasins de nécessité. In my opinion, it was very dirt and too expa sive for the quality we had. We had a lot of cockraoch in our private room and in the bathroom. Would not recommand.